Soon after the Stockholm convention on Environment, the Indian government responded positively by passing an act for the protection of India’s wildlife (both terrestrial and aquatic) and their habitats. Ever visited a Wildlife Sanctuary or a National Park? Taken a safari to enjoy the animals in the wild? Well, all that was possible only after the enactment of this Act. Why was this Act needed? A previous law, called the Wild Birds and Animals Protection Act 1935, had become completely obsolete. The jurisdiction of forests and wildlife came under the State governments, and each state government had a different policy in dealing with this subject. Furthermore, due to uncentralized regulation, huge exploitation of forests as well as the wild animals was going on for various economic needs. The numbers of different wild species of animals, including the cheetah, tiger, black buck fell sharply, and so did the total forest cover of the country. The Act was enacted to check this rampant disregard for the animals and birds of the country. The underlying objective of this Act is to protect the animals and birds of the country. The Act has 7 Chapters, 66 Sections and 6 Schedules as of today. Any amendment to this act can be done on the recommendation of an expert committee, that has been put together by the Indian Board of Wildlife. The Act has been amended in 1982, 1986, 1991 and 1993. The 6 Schedules of the Act specify the level of protection for different species. Schedule I and II are for endangered species, that deserve rigorous protection and the breach of these rules results in serious punishment. A famous case where this was applied was when Salman Khan was sentenced to 5 years in prison for hunting a black buck. Schedule III and IV is for species that are not endangered, but the protection and punishments are equally rigorous. Schedule V delineates the animal species that can be hunted, like deer or ducks, and the rules pertaining to their hunting. Schedule VI covers the protection and trade of medicinal plants as well as agricultural species of plants. Chapter IV of this act spells out the rules for the different types of protected areas that will be marked out for the protection of wildlife. Chapter V concerns with the trade and commerce involving wild animals, as well as prohibition of the hunting of trophy animals. It states that every wild animal is the property of the Indian Government. A license is maintained by the government for the regulation of hunting as well as possession of wildlife parts. Chapter VI spells out the punishments for different offences. 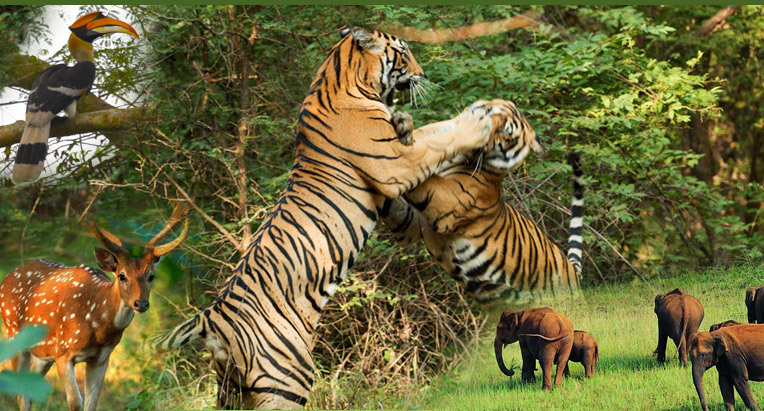 Wildlife Sanctuaries- A state government can declare any area as a wildlife sanctuary if it feels that the area has the necessary ecological importance. The setting up of the sanctuary is then taken up by the concerned District Collector. This includes the resettlement of people, if required, and the land acquisition process. Once the sanctuary is functional, the Chief Wildlife Warden is the highest authority for the sanctuary. He/She can provide permits for people to enter and utilize the resources within the sanctuary. It is not strictly off-limits. National Parks- The state governments are again responsible for taking initiative in declaring a site as National Park. National Parks are more strictly regulated than Wildlife Sanctuaries, with absolutely no other activity taking place within it’s premises. The boundary of a National Park is fixed and clearly specified, unlike a sanctuary. If this boundary needs to be changed for any purpose, a motion has to be passed in favor of it in the Legislative Assembly of the state. Closed Areas- These are areas that are temporarily off limits for a particular duration of time. Oftentimes, this for regulation of hunting of animals. Zoos- Under Chapter IV-A, the Central Zoo Authority has been set up to regulate the zoos of the country. Zoos help in ex-situ conservation, when protection in-situ is not possible or impractical. This has been described in Chapter VI of the Act. All offenses under this Act are considered non-bailable and cognizable; meaning no search warrant is required by the authority if they think a person/party is guilty of breaking any rules of this act, particularly the trade of animal parts. If a person is found guilty of breaching this Act (unless provisions are stated), it can lead to an imprisonment of a minimum of three years and a fine of minimum of 25,000 rupees. If a company commits a crime against this Act, all persons in-charge of the company/project in question, as well as the company itself, will be the liable party. This was a landmark Act in the environmental movement of India. It was soon after this that various other legislation like Water Act, Air Act and Environment Protection Act came into force.